Thanks for continuing to follow my Cruise Travel Blog. I’ve been gone a couple of weeks to fly back to Penang, Malaysia, to meet my parents and celebrate my Mum’s birthday. Not the easiest journey from Bergen (Bergen – Stockholm – Doha – Singapore – Penang) and took almost two days, but I got there eventually! Returning was at least a little easier, from Penang to Kuala Lumpur to London…and then 2 hours of tubes and DLR to Greenwich. About 36km according to Google maps. Which, to put into perspective, would have taken about 45 minutes in a ‘Grab’ taxi in Penang and cost me about AU$20. A taxi in England would probably have taken about 2 hours at that time (5.30pm on a Friday) and likely cost more than $150…but England is the most advanced of the two countries right… Still, its always nice to be back in my home town. So, I’m back on board, back with my fiance and feeling back at ‘home’ again (how many ‘homes’ do I have?!). I was greeted with warm welcomes and hugs from so many of the crew, it was really lovely. 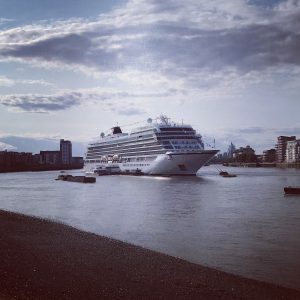 It was nearly 8pm by the time I arrived from the tender which transfers guests from Greenwich Pier Terminal to the Greenwich ‘Tier’ (basically a pontoon in the middle of the Thames for ships to dock at). Beven had thoughtfully booked us into the specialty restaurant ‘Chef’s Table’ for dinner so we dumped my case in our cabin and headed straight there for a delicious Chinese influenced menu with paired wines, seated in a quiet window table. I worked out that I’d been awake almost 30 hours and was feeling a bit like a zombie…definitely an early night required! Today is the end of a two-week cruise for the guests, so they disembarked in the morning and the new guests arrived shortly afterwards. It was nice to see a 6’7″ gentleman catch Beven and get teary as he told him how much he’d enjoyed the cruise and was so grateful for the job that Beven had done. Moments like this are so beautiful. It allows you to step back from the crazy day-to-day and remember why you do what you do. It also makes me so proud of Beven, as this particular gentleman is not the only one to have said this, each cruise I’ve been on there has been a similar scene, guests telling Beven that of all the cruises they have done in their lives (and these people cruise a LOT! ), this has been by far their favourite due to the Entertainment program and the team. So yeah, he’s killing it! We had breakfast up in the World Cafe and I have to admit, it was pretty surreal and very cool to be dining in the middle of the Thames, looking at the O2, the Shard, the London Eye and St Paul’s Cathedral…how often do you get to do that? We had decided to head into Greenwich for a couple of hours in the afternoon as Beven has never been here before (I used to live not too far away in my Uni days). Sadly though, it wasn’t the best weather, and after about 45 minutes when the heavens opened, we decided to head back to the ship. 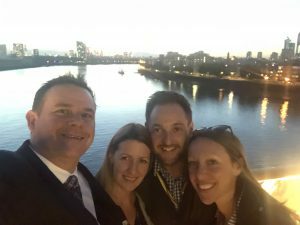 I had arranged for a couple of friends to come visit us, I’m not in London all that often anymore (although amazingly its been three times this year now!) so its always great to see loved ones, and even better when I can show them this stunning vessel we are currently living on. They arrived after the 5pm guest drill and we proudly showed them around the ship. 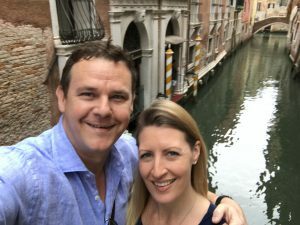 Nina has never been on a cruise ship before and Steve has worked for Royal Caribbean for many years, both on board and as a Sales Manager for Azamara – debatably a competitor for Viking Ocean Cruises. Always great to hear the feedback from both of these viewpoints – I think they were both pretty impressed. 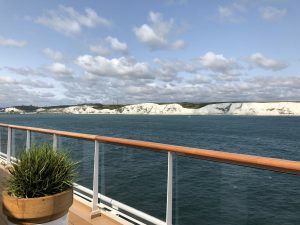 We had dinner in the Aquavit, which is the outdoor terrace on the back of the ship, next to the Infinity pool and feasted on the fresh seafood and steak, followed by indulgent portions of ice-cream with chocolate sauce…washed down with several glasses of wine. Life is pretty good right now! We ended the night with Monkey 47 G&Ts; in Torshavn watching the band, before they guys had to head home. We wake up to another gray and miserable day – yes I know, this is London. However, this bad weather has a much more dramatic effect for the Viking Sun. 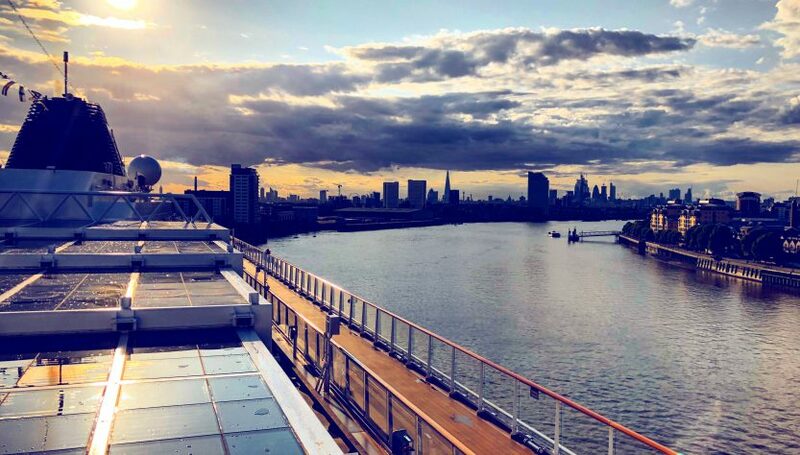 It’s actually really quite awesome that we are docked in London, most cruise ships aren’t able to do this, and that’s mostly due to the Thames Barrier. The Barrier is an incredible piece of engineering and architecture. Taking ten years to build, it opened in 1984 to prevent the floodplain of most of Greater London from being flooded by exceptionally high tides and storm surges moving up from the North Sea. The problem this causes for ships is that each section of the Barrier is only just wide enough for Viking Sun to pass through, with a mere few metres clearance each side. With a skilled Pilot/Captain and good weather, we can make it through, but with bad weather and strong winds such as today, its just too risky to pass safely. What this means, is that instead of departing at 2pm, we now have to stay docked and depart at 2am instead – when the tide is next high enough for us. More time for guests to enjoy London (in the rain! ), but the full day planned for Dover is now a half day, docking at 1pm instead of 8am. This causes a huge challenge for the Shore Excursion team who now have to cancel the booked day excursions in Dover and quickly find alternatives so that guests can still enjoy the shortened time in Kent. With the weather being so bad, we decided to stay on board all day. Beven had his Port Talk at 5.15pm which I attended. This was his and Judi, the Shore Excursion Manager’s chance to explain to the guests the revised plan for Dover and answer any of their questions. Personally, I was just disappointed that I wasn’t able to watch us sail out through the Barrier, hopefully we will another time. At 6pm I joined Beven and his ACD Matt for the Single Traveller’s Drinks in the Explorer’s Lounge, although no guests arrived, so after waiting half an hour we headed to the Dining Room for dinner. The menu always has a local flavour as well as the staples, so this evening I chose the Beef Wellington – yum! This evening’s show is the Captain’s Welcome in the Star Theatre, All guests are greeted with complimentary champagne and hear Beven’s first performance of the cruise before being introduced to the Officers and Captain, and finally entertained by the fantastic Viking Sun band and singers. This was followed by a drink in Torshavn with Matt, Jamie and Sophie (singers) and much-needed bed! This morning is now basically a ‘sea day’ for the guests. They are a more active crowd than the previous cruises I’ve been on board for – the gym was crazy busy and guests were still finding their way around the ship, exploring every area. To return to my point about the operations for a minute, as today was a ‘docked’ day, so no pontoon or tenders, we had the majority of supplies loaded onto the ship. Usually, the stevedores have a full day to do this, but again, the effect of the late arrival had major impact, and it was calculated that 2 pallets had to be loaded per minute in order to get everything on board on time. And yes, there were officers standing outside with stop watches, timing the operation to ensure its success. We grab an early lunch – English fish and chips with malt vinegar – in the World Cafe and get ready to head off shortly after Beven has done his clearance announcement (advising guests are cleared to depart the ship and give details of where the gangway is located etc). We head through the surprisingly large terminal and jump onto a blue double-decker bus which takes us into the city centre to meet with my sister and her husband who have driven to meet us. As kids, we sailed in to Dover quite a few times. It’s funny how the memory bank works – as we pulled out of the harbour, I could recall the lines of fishermen on the walls of the port like it was yesterday – nothing had changed! Sadly that also applies for Dover as a town itself. I don’t think it’s changed in about 30 years…it’s still a pretty rough, run-down town with very little charm, aside from the Castle at the top of the hill and a few historic buildings remaining around the area. We googled ‘best pub in Dover’ and it brought up ‘The White Horse’. An interesting little place with handwriting over every single piece of wall and ceiling, written by people who had been thereafter completing swimming across the Channel to France – a very impressive accomplishment. The staff were friendly enough and the wine and beers were cold…that’s all we needed for a precious family catch-up! Most of the guests took the complimentary revised tour to Canterbury, which is really beautiful. 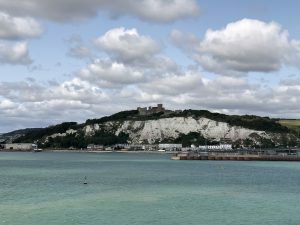 If we’d been here longer, a trip to Leeds Castle would also have been great, but otherwise, Dover certainly isn’t a highlight port for this itinerary (although sailing past the White Cliffs of Dover is always quite special). Beven hosted the Cruise Critic passengers with the General Manager, Camille and then I met him for the first performance of The Sounds of the Sixties, the production show. The turnout wasn’t great, which was surprising, until I heard that there had been an issue at the gangway and guests were still coming back onto the ship. I thought it a bit weird that guests were still in jeans, jumpers and coats! We grabbed dinner in the World Cafe afterwards and then headed back for the second performance at 9.15pm. You couldn’t have got a more different show! The theatre was packed, with guests standing in every free space they could find, they were singing, dancing, cheering and absolutely loved the show, with a full standing ovation to end. I felt like I was at a concert, I’d not seen this reaction for any other show on this ship! Such a fabulous atmosphere. It’s so interesting to read your commentary from the “other side” of the cruise experience. 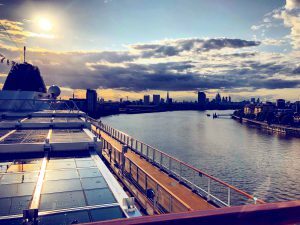 I had my 2nd cruise (first on viking) in feb 2019 with Beven as director and it was my husband’s first cruise. He was so impressed by Viking staff that he booked another cruise (river, 2 weeks in France—I have some trepidation about the impact of variable water levels, so not quite as enthusiastic). Congrats on your nuptials! (I follow Beven on IG). Keep writing! !